The Sculpture Garden features a permanent but ever-changing outdoor exhibition of the wonderful Mambo stone sculptures in a beautiful garden setting. Each sculpture is a unique original. It is a special experience to see how the landscape and the sculptures interact and complement each other. At times visitors may hear, and see, a sculptor at work on a new piece in the Garden. If a wedding reception has been booked at the Old Mutual Conference and Exhibition Centre, the wedding ceremony may be held and/or the photographs taken in the Sculpture Garden. 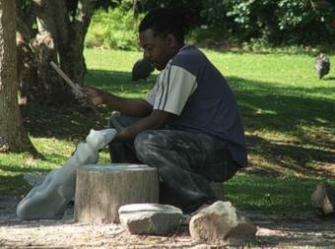 The Mambo stone sculptures follow the Shona tradition. 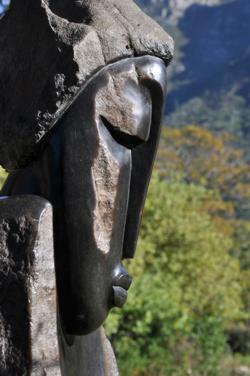 With the inauguration of the New National Gallery in Zimbabwe in 1957 under the directorship of Frank McEwen, the quality of African art as expressed by the Shona sculptures began to be recognised internationally. At this time, many of the sculptors were breaking away from the realistic portrayals and started experimenting with individualistic expression. McEwen encouraged the artists to use harder stone and develop their own techniques, and became an energetic mentor to the artists, helping them show and sell their work. At the end of his directorship in 1973 he established Vukutu, a workshop school with Sylvester Mubayi in the highlands of Zimbabwe. It and other sculpting communities that started up, like Tengenenge founded by Tom Bloemfield, have provided encouragement and support for the artists, giving them access to good tools, stone, advice, encouragement, financial assistance and exposure through international and local exhibitions. This support has also allowed the artists to remain true to their authentic creativity and avoid having to mass-produce for the tourist market. The artists express themselves, they are not copycats carving what they think tourists will buy. Artists depict spiritual, traditional and contemporary themes as well as topical and social issues in their work. The sculptors select their own piece of stone. The stone is genuine serpentine or one of its forms: springstone, leopard rock, lepidolite or opal stone. Its colour varies from black to brown or green, orange and variegated. The artist works together with the stone. The artists believe that it has a spirit and life of its own and can feel the sculpture coming out of the stone. One is always aware of the stone’s contribution to the finished sculpture. Both men and women do the sculpting. They use hammer and chisel and metal rasps, finishing with sandpaper for smoothing and polishing with wax polish. It can take a few weeks to a year to complete a work. Mambo sculptures are also on display in the Visitors’ Centre courtyard area and just inside the Garden entrance, and a wide range of sculptures, large and small, is for sale via the Mambo Exports sales office in the Visitors’ Centre. Visitors’ Centre, Gate 1, near the entrance to the Botanical Society Bookshop.